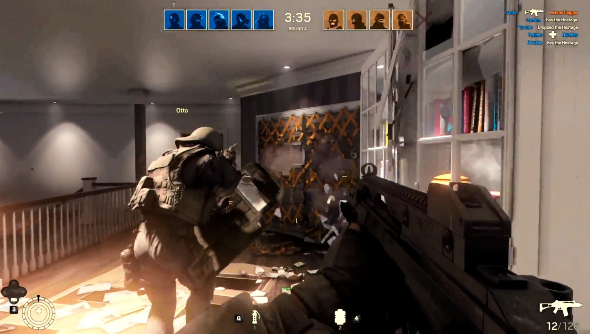 As is becoming traditional for Ubisoft, the French developer pulled out another ‘next-gen’ jawdropper at E3 this year in the form of Rainbow Six Siege. Everyone got excited, partially because we’ve been ever so hungry for a new Rainbow Six game for too long, but mostly because it looks exceptional. All that excitement has been machine gunned in the form of accolades over this latest Rainbow Six Siege trailer. You can almost see its smugly satisfied grin beneath the clouds of obliterated plasterboard. If what you saw at E3 just wasn’t enough, you’ll find some good news at the end of the trailer: Ubisoft will be live streaming some Rainbow Six Siege gameplay tomorrow, Thursday 17th July. Tune in to Twitch at 8pm CET (7pm in the UK). Post that, it’ll be a long wait until the game’s release in 2015. Ubisoft is well known for blasting out trailers like shotgun buckshot though, so expect to see more of the game in action sooner rather than later.